The Mueller probe was based on dark and black propaganda lies and a sinister machination started in late 2015 by the Obama administration and presidential candidate, former Secretary of State, Hillary Clinton to subvert and undermine candidate Donald Trump’s presidential campaign, the political system, and our republic. The investigation was a sham; and even though it recently found collusion had not occurred between President Trump and Russia to influence the 2016 election, Mueller’s investigation was part and parcel of a deliberate attempt by the powerful establishment ruling class to hold onto power, through the use of the levers of government to effect a soft coup. From late 2016, political operatives with deep ties to the Clinton family circulated two different dossiers smearing President Trump as a Russian puppet and traitor to America, while useful idiots in both parties assisted in advancing the false Russian collusion narrative into the upper echelons of Obama’s Intelligence Community. CIA Director John Brennan, DNI head James Clapper, and FBI Director James Comey leveraged the false dossiers to operate an illegal surveillance campaign against Donald Trump and his inner circle. And after Donald Trump’s victory, the operation continued as an effort to neutralize the election results and unseat President Trump as an illegitimate president and a traitor to America. “Russian collusion” and numerous leaks from Comey, Brennan, Susan Rice and the creation of a special counsel were all part of a preemptive defense of assorted crimes committed by Obama officials, such as illegally leaking classified information to the media, deceiving the FISA court, lying to the FBI and Congress and obstructing justice. All of this was to divert attention from their wrongdoing, and there never existed any evidentiary reason to appoint a special counsel, other than to make a crime fit the man, Donald Trump, just like they used to do in the old Soviet Union. Does the full Mueller Report mention that the Steele Dossier, the document that formed the basis for his investigation, was manufactured and bought by Hillary Clinton associates and employees? Does it note the repeated use of this falsified document to improperly and illegally prolong the inquisition? How could Mueller not acknowledge such revelations? And if not, what sort of investigation has this been? By May of 2017 and the beginning of Mueller’s investigation, the Steele Dossier was already denounced as a fraud. FISA transcripts of surveillance conversations had already revealed no direct evidence of collusion, as FBI agent Peter Strzok warns his lover and fellow FBI agent Lisa Page that “there’s no big there there”. How many legitimate investigators and how many Americans are asking: Was the FISA judge in on this conspiracy, or was he unaware of it? America has already witnessed numerous activist liberal Leftist judges try to stonewall legitimate executive orders from President Trump designed to protect America, revealing serious questions about our judicial system and the rule of law. Thirty million dollars and two and a half years later and after 2800 subpoenas, 500 warrants, and 500 witnesses, America is notified there wasn’t any Russian collusion or any obstruction of justice, and that in and of itself is, ipso facto, an exoneration. Whatever Mueller’s intention, his innuendo absent of formal charges was a transgression against the spirit of the American justice system. It will be most interesting to hear any forthcoming explanation, before the House Judiciary Committee. Just hours after the release of the Mueller Report, President Trump exclaimed: “It began illegally. And hopefully, somebody is going to look at the other side. This was an illegal takedown that failed … “. Paul Sperry, author and former fellow at the Hoover Institute, rightfully notes: “President Trump called the investigations of him and his advisers ‘illegal’. That is not hyperbole. What the Obama FBI and DOJ pulled was worse than Watergate. AG Barr must now hold the dirty agents to account by impaneling a grand jury investigation of the investigators. In the end, Watergate brought down a president over a far less serious crime than the numerous crimes that have occurred at the direction of Obama underlings. Does anyone really believe President Obama was completely in the dark regarding the sedition, espionage and near treason being perpetrated against the nation? Every quisling and each person and each organization that perpetrated and advance the Russia hoax, literally the entire Democratic Party in both houses of Congress and every news media personality at The New York Times, the Washington Post, ABC, CNN, NBC, and CBS should go out in their back yards and blow their brains out, or slit their wrists in a warm bath, but they won’t, because they know no shame over their attempted treasonous coup. So, they should be rounded up in busses at the FBI and DOJ for criminal conspiracy; continue on to the Democratic National Committee, and arrest every member of the Clinton campaign with the knowledge of this monstrous conspiracy; and, prosecute them all in batches just like Nazis at Nuremberg. President Trump should do all he can to encourage U.S. Attorney William Barr to prosecute Hillary Clinton on anything associated with this conspiracy, including a renewed and deeper look into the mishandling of the Clinton email investigation, investigating the investigators. 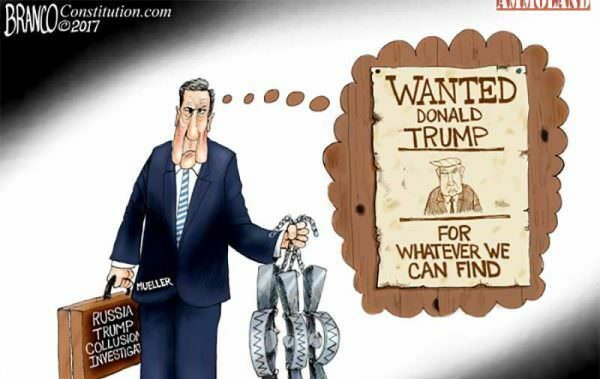 They must pursue the criminals and traitors to America and get to the bottom of the FISA warrant abuses and RussiaGate. They must release the FISA applications, FBI 302 forms and 1023 counterintelligence documentation that is still classified, because it will take these actions and President Trump acting with the iron will of Andrew Jackson and Ulysses S. Grant to completely drain this modern political swamp and physically wrest our beloved America from that rapidly approaching iron grip of tyranny. The instigators of this coup attempt have damaged America in untold ways and they must be brought down and exposed, along with their collaborators. From start to finish, this sorry episode in history has shown Americans that two sets of rules exist in America, one for the elite and one for the common average American and that the justice system works to punish anyone challenging the rule of the establishment elite. That’s poison to our freedom and liberty in America. Justin O. Smith has lived in Tennessee off and on most of his adult life, and he graduated from Middle Tennessee State University in 1980, with a B.S. and a double major in International Relations and Cultural Geography – minors in Military Science and English, for what its worth. His real education started from that point on. Smith worked 8 years for the LaVergne Fire Dept – two years as their clean-up boy – and became a working fireman at age 16, working his way through college and subsequently joining the U.S. Army. Since then he primarily have contracted construction and traveled – spending quite a bit of time up and down the Columbia River Gorge, in the Puget Sound on Whidby Island and down around Ft. Lauderdale and South Beach. Justin currently writes a weekly column for The Rutherford Reader in Murfreesboro, TN, which he calls home and he spends as much time as possible with his two beautiful and intelligent daughters and five grandchildren. Justin Loves God, Family and Our Majestic and Wonderful America, and he is a Son of Liberty. Time to End SlaveryPresident Trump Strikes Back!